« The Bell Sounded and the 2018 Season Began! Bringing Together the Old and the New! Friday, June 29, 2018 Have you met the alpacas Carl and Gandolf? 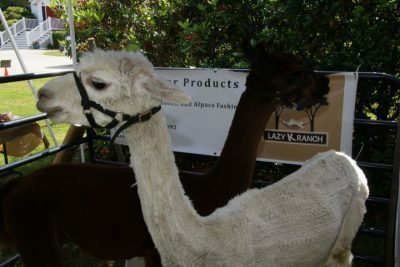 For the past couple years they have been attracting visitors to their shady space at our market, adjacent to The Lazy K Ranch booth where beautiful alpaca yarn items are available for shoppers. Those alpaca creations will keep the wearer warm next winter while bringing back fond summer memories. Our market businesses surround a grassy expanse, much like a village green. After visiting with the alpacas a shopper might head west around the green which means a stop at Sand Hill Cove Photography. 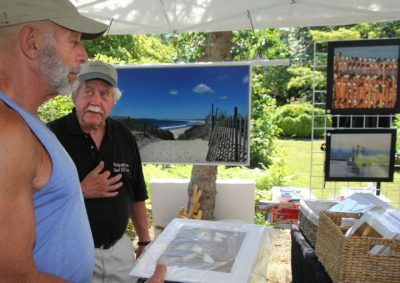 Don Cameron uses his artist’s eye when capturing scenes from South County. His cards and matted pictures make it possible for people to bring home images of favorite places here in Charlestown and beyond. But if a shopper turns east, then Stoney Hill Cattle Company awaits. 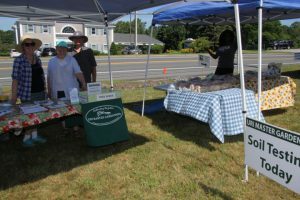 This local farm, returning to our market this year, produces delicious meat and poultry products from animals that have led lives grazing and rooting in the pastures located on Shumuncanuc Hill Road right here in Charlestown. There are fresh eggs and this particular market day, there were MUSHROOMS! Perfect to top off a grilled steak! 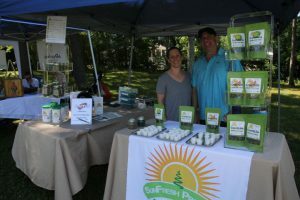 New to our market this year are SunFresh/Spirulina products produced in our own RI. Choose from a variety of protein rich granolas and snack foods. Samples are right there for all-presenting a tasty and nutritious set of choices. Our community often gathers around the musicians that visit our market each week. Farm Dog had a following of all ages spreading blankets and preparing to keep time to the tunes. 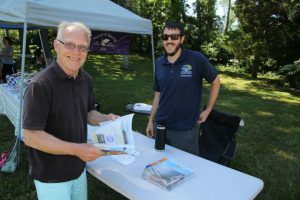 Our visiting community groups this week included Ray from Charlestown Parks and Rec offering information about the ever expanding opportunities for activities, many at Ninigret Park, just down the road. Scott MacNeill, Director of the Frosty Drew Observatory, offered viewers a look, through his special scope, at the red, wave embued aura surrounding the sun. Not far away was the URI Master Gardeners’ booth with answers to questions, soil testing availability, advice, and FREE SEEDS! 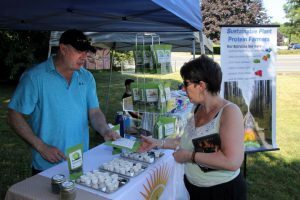 Having local nonprofit organizations show up at our market each summer can open up awareness and bring new information to our shoppers…Thanks to all of the those who volunteer their time to share with us! This week our SNAP/CREDIT table was in full swing. Julie was (and will be) available to exchange credit cards for market cash. And shoppers with SNAP cards? Bring them along to double your purchasing power for fruits and vegetables by receiving Bonus Bucks (thanks to Farm Fresh RI). This coming Friday, BE ON HAND for Indie Cycle where all your old electronics can be recycled for free….anything with a cord might be eligible for this service. The Y Garden Club will be on hand with their local gardening knowledge. And for music, we have Charlestown’s own Chris Fee!